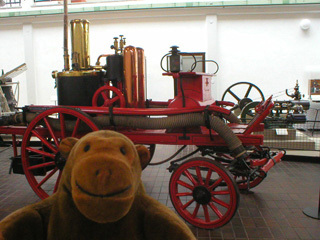 "That's a little strange, you know"
In the early technology gallery, Mr Monkey studied a steam-powered horse-drawn fire engine, which was nice and shiny. 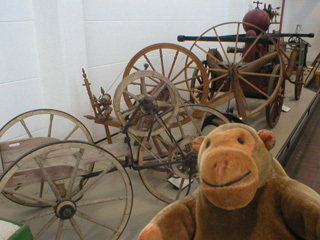 He was slightly puzzled by the strange early tricycle, which looked rather as if someone had tried to convert a spinning wheel into a way of getting around. It's allegedly powered by the rider turning the small wheel at the front.